Possessions blaster rifle, power packs (x8), cybernetic right arm (Enhanced Capability: +1 Equipment bonus on all Mechanics and Use Computer checks), memory implant (can trade out any logic upgrade as a standard action), medical kit, datapad, medpac (x6), liquid cable dispenser, comlink (short-range, encrypted), code cylinder, electrobinoculars, credit chip (21,877c). Logic Upgrade: Skill Swap (Acrobatics) Select a skill she is not trained in (other than Use the Force). As a full-round action, she can swap this skill for one she is trained in. Logic Upgrade: Skill Swap (Pilot) Select a skill she is not trained in (other than Use the Force). As a full-round action, she can swap this skill for one she is trained in. Logic Upgrade: Skill Swap (Swim) Select a skill she is not trained in (other than Use the Force). As a full-round action, she can swap this skill for one she is trained in. Logic Upgrade: Skill Swap (Treat Injury) Select a skill she is not trained in (other than Use the Force). As a full-round action, she can swap this skill for one she is trained in. Logic Upgrade: Tactician Once per encounter, she can use the aid another action to grant a single ally a +5 bonus to their next attack roll against an opponent instead of the standard +2. Larin Voss'irira is an Imperial special forces soldier, technician, and cyborg who works for Zero Company. She was captured sold into slavery as a child but was rescued during the Imperial invasion of Malastare. 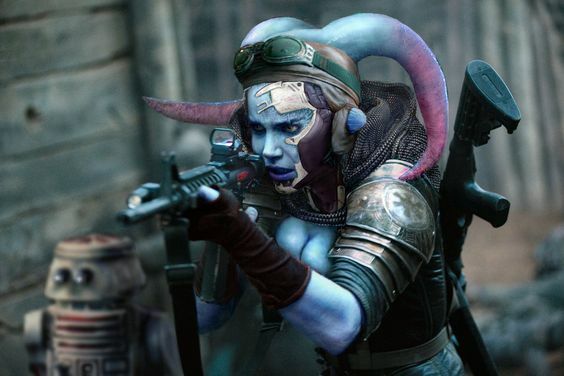 She decided to devote her life to helping others by bringing law and order to the Galaxy. She's bothered by the speciesist attitudes of the Empire, but sees this as a neccessary evil.